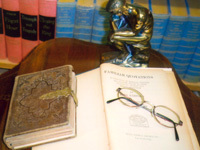 Welcome to the quotes and literature links area of the Artisan website, where you will find a collection of literary resources on the web where you can fortify your mind with the wisdom and writings of the past including inspirational quotes, poetry, and classical literature. New links will be posted occasionally...enjoy your travels! "A teacher's first duty is not to assign, but to inspire. He is not merely a walking textbook filled with encyclopedic facts neatly arranged for dictation, but a dynamo charged with a contagious enthusiasm." 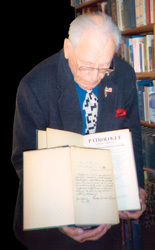 We dedicate this literary resource page to the memory of Dr. Oscar G. Darlington (1909-2006) in appreciation for his lifelong scholarship and pursuit of knowledge, culture and wisdom, and for the love of books, literature and history that he has inspired in so many of the people he has come into contact with over the years. We hope that the intelligent connections provided on this page might continue to inspire the same kind of enthusiasm for learning that he strived to instill in his students, family and friends during his lifetime.